The Gospel is the most basic, foundational message of the New Testament, yet it's the most misunderstood. Today's religious system is not preaching the same Gospel that Paul did. They mix it with the Law, and that isn't the Gospel at all. The book of Romans was written to explain the Gospel so that anybody could understand it. Paul, the writer, made it so simple that you'd have to have somebody help you to misunderstand it. And, unfortunately, we've had a lot of help! That is a radical statement. This word "gospel" in the original Greek is a word that was seldom used at the time this was written. Nobody talked this way, because the word literally means nearly-too-good-to-be-true news. It referred to news that was so awesome, nothing really justified using it. Nothing was nearly too good to be true. But Paul said he was not ashamed of the Gospel. Why? "For it is the power of God unto salvation to every one that believeth; to the Jew first, and also to the Greek." The Gospel is the power of God, and that's talking about grace. Acts 20:24 and Galatians 1:6 both use the terms "gospel" and "grace" interchangeably. It's saying that when you understand the Gospel, or the grace of God, it'll release the power of God into your life. That's huge! Notice that righteousness is not revealed from Law to Law, from good deed to good deed - it's revealed from faith to faith. Here's a good piece of information to consider: Sin won't stop the power of God for salvation in your life but trusting in your own good works will. That's what "the righteousness of God is revealed from faith to faith" means. You receive the righteousness of God by grace through faith (Eph. 2:8)! God won't withdraw His power because of sin in your life. That's why it's nearly-too-good-to-be-true news. When you talk like this, people with a religious mindset immediately say, "Well, what about sin? This sounds like you're just giving people a license to sin." Not so! Last I checked, people were sinning without a license! I'm not advocating sin. But, see, this is the immediate reaction when you start talking about righteousness by faith. They think you need to make people aware of their sin and the wrath of God. For the wrath of God is [already] revealed from heaven against all ungodliness and unrighteousness of men, who hold the truth in unrighteousness;  Because that which may be known of God is manifest in them; for God hath shewed it unto them. Notice it says it's manifest in them, not to them, for God has shown it unto them. God has put in every single person who has ever breathed an intuitive knowledge that they are a sinner and that they deserve rejection instead of acceptance. You don't need to tell people this; they already know it. We aren't called to convict people of their sin but to convince them that the only way they can obtain righteousness, or right standing, with God is through putting faith in what Jesus did for them, not through something they've done. That's why I spend so much of my time on this, and it's what many of my teaching materials are devoted to. And he spake this parable unto certain which trusted in themselves that they were righteous, and despised others:  Two men went up into the temple to pray; the one a Pharisee, and the other a publican. The Pharisee stood and prayed thus with himself, God, I thank thee, that I am not as other men are, extortioners, unjust, adulterers, or even as this publican. I fast twice in the week, I give tithes of all that I possess. And the publican, standing afar off, would not lift up so much as his eyes unto heaven, but smote upon his breast, saying, God be merciful to me a sinner. I tell you, this man went down to his house justified rather than the other: for every one that exalteth himself shall be abased; and he that humbleth himself shall be exalted. This is a powerful parable. Let me ask you: Are you like the Pharisee or the publican? I'm not talking about your actions but your trust. Do you trust in what you do for the Lord or what He has done for you? If a person is putting faith in all of their religious acts - all of their holiness - then that will actually block them from righteousness and relationship with God. But the person who maybe hasn't been as good, yet they've humbled themselves and cried out to God, this is the one who enters into right standing with God. What shall we say then? That the Gentiles, which followed not after righteousness, have attained to righteousness, even the righteousness which is of faith. But Israel, which followed after the law of righteousness, hath not attained to the law of righteousness. Wherefore? Because they sought it not by faith, but as it were by the works of the law. This says there are two types of righteousness: a faith righteousness and a righteousness that comes by the Law. Righteousness by the Law is a righteousness based on performance. Another way to say it is "self-righteousness." The truth is, nobody can perform well enough to get Law righteousness, because the Bible says in Isaiah 64:6 that "all our righteousnesses are as filthy rags." And James 2:10 says that if you keep the Law and yet offend in one point, you are guilty of breaking the entire thing. In other words, if you did ninety-nine out of a hundred things right and one thing wrong, according to the Law of righteousness, you would be unrighteous. BUT! If you put your faith in Jesus, you would receive His righteousness - faith righteousness - even though you did ninety-nine out of a hundred things wrong! What a deal! There are many people today who wouldn't consider themselves to be seeking after Law righteousness, but they really are. Their only hope of entering into heaven instead of hell is that they go to church, they try to be good, they live up to some standard of morality. That's what this is talking about when it says the Jews weren't seeking righteousness by faith but by the Law. They were trying to earn what God had given as a gift. For they stumbled at that stumblingstone. It is offensive to people, particularly if they have a lot of holy actions to their names, when you tell them that all their good deeds don't make them righteous before God. Then when you tell them sinners who only put faith in God are more righteous than they are (Matt. 21:28-32), that really puts them over the top! They say, "You mean I'm not any better than the person who's been out living in sin?" That's exactly what I'm saying. That's exactly what Paul and Jesus said. "Well, what have I been doing all this for?" Good deeds will help you, to a degree, in your relationships with people, but they won't give you any clout with God. You could have more holy acts than anyone you know, but who wants to be the best sinner who ever went to hell? All have sinned and come short of the glory of God (Rom. 3:23). We need a Savior! The only thing we have to offer is faith. We just believe the nearly-too-good-to-be-true news that Jesus died for us and paid a debt we couldn't pay and gave us a righteousness we couldn't earn. It's faith righteousness! "Well, I believe in Jesus, but I believe I also have to live holy to be accepted by God." That's saying Jesus' payment for sin wasn't enough - that you have to add to what Jesus has done - and I believe that is the greatest sin of all! Jesus either paid for it all, or He paid for nothing at all! It's not Jesus plus you; it's Jesus or you! It's not you doing the best you can and then Jesus making up the difference with grace and mercy. If you try to mix the two, you have totally polluted what Jesus has done. It's either faith righteousness or your righteousness, but not a combination of the two (Rom. 11:6). It takes a supernatural revelation by the Holy Spirit to be able to understand this. But once you do, it'll transform the way that you view God, the way that you relate to God, and the way that you receive from God. 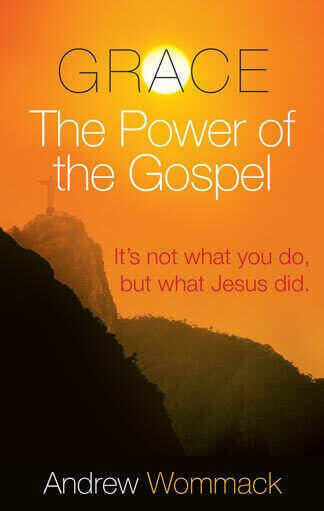 The Gospel is the power of God unto salvation. I encourage you to just humble yourself and ask God for a supernatural revelation of this truth. It's tremendous. When you truly get a hold of the grace of God, I guarantee you, it sets you free from sin, not free to sin. You'll wind up living holier accidentally than you ever have on purpose. You'll serve God out of love stricter and stronger than you ever would have out of legalism. Jesus said you shall know the truth and the truth shall make you free (John 8:32). It's not truth that sets you free; it's the truth you know that sets you free. But before you can know it, you've got to hear it. Faith comes by hearing and hearing by the Word of God (Rom. 10:17).